For a lean bulk to be possible, you have to start out lean (obviously). This is important because the first step of a lean gaining phase may actually be a cut. As we explained in the article Get Lean before Bulking, starting from a low body fat percentage allows you to gain more weight before you get excessively fat and the majority of that weight will be muscle mass because of improved nutrient partitioning. In this post we’ll cover everything you need to know about setting your nutrition for gaining muscle with minimum fat. It’s a long read but the information is all very valuable. 1. If you’re over 14% body fat, lose some fat before you start bulking. Yes, you are going to look skinny in clothes but the benefits of starting with a cutting phase strongly outweigh the temporary loss in size. 2. Keep cutting until you hit 9-10% body fat. When you get a complete 6 pack in good lighting you know you’re there. 3. Once you reach 9-10%bf increase your calories to maintenance for about 2 weeks. This will help reset some of the physiological adaptations to dieting and prevent rapid fat gain once you move into a surplus. After those 2 weeks start lean bulking. These lean bulks should be stretched over several months. 4. Once you’re up to 14-15% body fat it’s time to cut back to the 9-11% range. Ideally, as you’re gaining size you’ll never go above 15% body fat again. Your cut and bulk cycles will be kept in the range of 8-15% body fat. This way you’ll have a 6 pack all the time (or at least a 4 pack), your face will stay relatively chiseled, and you’ll have decent muscle definition and separation. You will look good all the time! During your cuts you should be careful not to lose muscle and maintain your strength on the main lifts. 5. Repeat this process until you’ve built enough size to not look small at 9-11% body fat. At that point you can get leaner and bring your cut-bulk range to 8-11%. So you’d bulk until you hit 11-12% and cut until you hit 8%. 6. Repeat this process until you’re happy with your size at 8-9% and then maintain that condition. So this is my basic philosophy for bulking. By cycling your cuts and bulks in the range of 8-15% body fat you can gain a lot of muscle mass over the years AND look good all that time. During the bulking periods I believe we should strive for lean gains as much as we can while not compromising the rate at which we can gain muscle and strength. What Eric is saying here is that we can’t stimulate muscle growth by eating more. If that was possible, every fat person would also have a lot of muscle mass. But we all know that’s not the case. The truth about eating for muscle growth is this: The maximum rate of muscle growth can be achieved by eating just enough food to permit the adaptation after training. There is only so much muscle the body can create in one day and giving it more nutrients than it can use won’t speed up the process. It’s like a worker building a house. He won’t build the house faster if you give him more materials than he can use. In fact, the unused materials will just pile up around the house – just as body fat will pile up around the muscle. On the other hand, if you give the worker less materials than he can use he’ll build the house slower. Or if you don’t give him any materials, he won’t be able build anything even if he shows up for work. You can now understand why the same workout routine produces different levels of muscle gain during a cut, maintenance, or bulk. Although our training stimulates the same degree of growth in all situations, the availability of nutrients permits or doesn’t permit the adaptation. The energy needed to maintain life (breathing, body temperature, pumping blood, etc.). The reason muscle growth is maximized during a bulk is because that’s when we eat enough nutrients to cover all these things. We make sure to eat enough calories to support our daily energy needs and recovery, and then we eat a bit more to allow growth. New muscle tissue can’t be created out of nothing. That’s exactly the opposite of what we do during a cut. We deliberately eat less energy than our bodies need in order to tap into body fat reserves. Recovery and growth are thus impaired. Besides providing the nutrients necessary for recovery and growth, eating a surplus of calories also gives you energy to train harder. Training harder means faster progression resulting in a better growth stimulus. Ok, you now know that in order to maximize muscle growth and avoid fat gain, you need to eat just enough. But how much is that? Your ideal caloric surplus depends on your training experience and how much muscle you can still gain. For example if you’re an advanced lifter and you can only gain 3-4lbs (1.3-1.8kg) of muscle in one year, then it makes no sense to gain 2-3lbs (0.9-1.3kg) of bodyweight per month. You’re still going to grow just 3-4lbs in that year, the rest will be body fat. On the other hand if you’re a beginner, gaining at the rate of 2-3lbs per month would be ideal because you can gain about 22lbs (10kg) of muscle in your first year. How to do it: If you want to dirty bulk eat enough food to grow two times faster than the rates in the tables above. That usually means about 18-19kcal per pound of body weight. The reason for that is because the rate of muscle gain is usually very slow. Beginners and Intermediates would progress at a much faster rate if they allow for some fat gain. I tried doing it when I was just starting out (I was 150lbs/68kg at the time) and while I was making lean gains, the people at my level who were eating more were making better progress in the gym. From my experience two thirds of the weight gained this way will be muscle mass. In the worst case scenario you gain muscle and fat at 1 to 1 ratio. That’s still pretty good. For example in my first real bulk, using Greg’s Greek God Program I was able to go from 155lbs (70kg) at 10% body fat to 173lbs (78kg) at 14% in 6 months (watch the video with my transformation here). After two more months of cutting I ended up 166lbs (75kg) at 8-9%. I was very happy with the results. 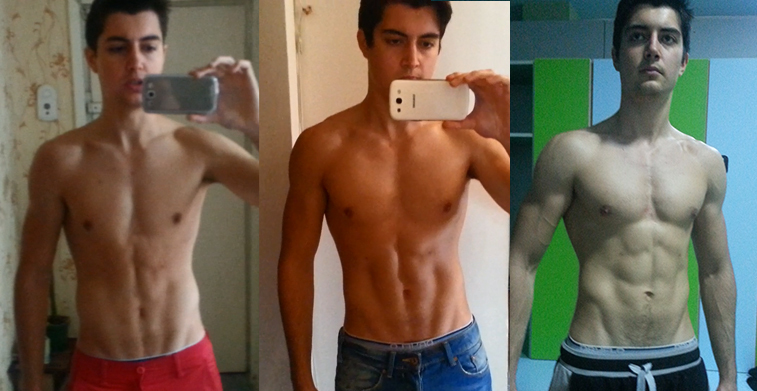 The first picture was taken at the end of May 2014 and I was 155lbs (70kg). The second was taken at the end of October and I was 171lbs (77kg). The third was taken at the middle of December and I was 166lbs (75kg). The best part about this strategy is that you can be in a surplus for 5-8 months before you need to cut for 6-8 weeks. And from my experience you make much better strength and lean mass gains in these long bulks than you do in shorter ones even if the amount of weight gained is the same. I can’t yet explain why. How to do it: Eat enough food to grow 1.5 times faster than the rates given in the tables above. A great starting point for beginners is 350 calories above maintenance every day. This will result in approximately 3 lbs of weight gain per month. Intermediates might go with 250 calories above maintenance every day. This will result in approximately 2 lbs of weight gain per month. Advanced lifters will probably do best if they gain just one pound or so per month. I recommend you start with the lowest numbers first (250-350 kcal above maintenance) and see how you progress from there. If you’re not gaining weight at all or you’re barely gaining, then you need to increase your calories further (add 100-200 more kcal). If you see you’re gaining too fast and your waist is getting bigger, lower your calories by 100-200. Be aware of daily fluctuations in weight though. Sometimes you may be 2-3 pounds heavier or lighter than the day before without making any changes to your diet. You should not adjust your calories if this happens. Track your weight and progress over a longer period of time (one or two weeks). Before we move on to setting macros I wanted to clarify why some people may have to eat a lot more calories than I recommended in order to gain weight. The reason for that is because they burn off the surplus by unconsciously moving more. These unconscious movements have been called Non-Exercise Activity Thermogenesis (NEAT). These are movements like bumping your leg on the floor, playing with objects, changing position, and fidgeting in general. What you can see is that the total weight gained is much less than what you’d expect. On paper, 1000 calories over maintenance for 8 weeks should results in about 7.2kg (16 lbs) of weight gained. But in this well controlled study only an average of 4.7 kg (10 lbs) was gained. If we do the math we’ll see that only about 400 calories out of 1000 were stored and the rest were burned off. And more than two thirds of the burned calories were dissipated through NEAT. However, the energy burned through NEAT varied drastically between subjects. You’ll see that the highest NEAT responder burned 692kcal per day while the lowest responder only 98kcal. The former is probably one of those people who cannot gain weight no matter what and the latter is one of those that gets fat just by thinking about food. This study shows that we cannot always estimate how many calories are necessary to gain 2-3 lbs a month. The surplus we set on paper and the one that actually occurs may be very different. The naturally skinny guys probably need 500kcal+ over maintenance to gain at the ideal rate while some other people may only need 200kcal. I suggest you start with only 250-350kcal over maintenance and see if you gain at the rates given in the table above. If you gain too slowly, then increase the calories as needed. Remember to make small increases in calories. This way you’ll avoid unnecessary fat gain. Setting macros when bulking is really simple. You need to make sure you’re eating about 1g of protein per pound of body weight and fill the rest of the calories with a good balance of fats and carbs. However, there is a lot of individual variability here. A small part of the population feels better with a lower fat intake (about 20% of calories) and a lot of carbs. They gain less body fat by doing this and have better energy levels in the gym. Some examples I know are Mike Matthews from MuscleforLife and my workout partner Rareș. What is your opinion on lean bulking? Do you have something else to add? Any questions? Leave a comment below and let me know. I read and answer all comments. Do you want to build a muscular, lean, and proportionate physique like Brad Pitt in Troy? First I want to thank you for the good content that you offer on your site. You have a very clear way to explain things. Keep it up! Secondly, I have a request to make. When determining maintenance calories (by calculating 14-16 x BW), I should take lean bodyweight or the total bodyweight? The same applies to determine the grams of protein per pound of bodyweight goal, I should take lean bodyweight or the total bodyweight? Thanks Braian! I appreciate your feedback! Unless you’re above 20% body fat, you should use your total bodyweight for determining maintenance. The same goes for protein. If the person is above 16% body fat, I set protein intake based on lean bodyweight. If they are relatively lean, I always tell them to set protein based on total bodyweight. I am about to lean bulk after cutting and lifting for one year. Will I be considered a beginner or an intermediate? I’d say you’re an intermediate. I was just wondering, I see all fo this as something extremely helpful so I thank you in advance because it is really hard to find information like this nowadays. as far as setting up your maintenance calories, which formula or calculator would you suggest?? please, and thanks! I go with the very easy formula of 15 calories per pound. No matter what formula you use, it will have to be adjusted anyway based on feedback. What I recommend is to set your maintenance at 15 calories per pound and watch your weight. If it stays the same, that is your maintenance. Then you can set your caloric surplus. Nice article,I’ve cut down from 100kgs to 60 kgs and finally had a 6 pack ,I’d say that I’ve been training correctly and consistently for bout 3 years ,I’m 35 years old and now trying to lean bulk ,I’ve tried eating 1800 cals but my waist went up too fast so I dropped it to 1500 cals till my waist came down and now I’m eating 1700 cals as I don’t want to gain weight too quick .Im now 65kgs and 179 Cm height .Ive gained about 1kg per month on 1700 calories.According to calculations I should be eating over 2000 cals right or am I just 1 in a Million that should reverse diet to avoid fat gain.I basically don’t know my maintenance calories. Hi Reagan, I am in a similar but not as extreme situation. I lost a lot of weight over a long period of time so I was in a deficit for maybe 1 year or so while I finally figured out how to make everything work with training and nutrition. I have been lifting only about4 months but have made pretty decent muscle development already doing body weight exercises before that. I have started lean bulking about 4 weeks ago and am gaining fat a lot faster than anything I read says I should. It feels like I have damaged my metabolism by being in a deficit for so long. Your example seems extreme though. You maintainence should be around 2100 for your weight (same as me) so to be gaining fat at 1700 or 1800 is crazy. There doesn’t seem to be much info out there on this stuff for people in this situation which is surprising given how many people are overweight these days. There must be a lot of people who need to be in a deficit for a long time to get lean. It would be very interesting to hear Radu’s thoughts and advice on this. It i ve seen people gaining fat on that amount of calories because they didn’t set the macronutrients right..like he was eating more than a 100g of fat and less proteins that it should..after changing he could maintain his weight at the formula that radu just said 15 kcal per pound..
First off, congratulations on cutting off the fat! I am an avid bodybuilder, 40 years old, currently 160 pounds scale at 6% body fat. I have weighed almost every ounce I have consumed over the past year and 3 months and have total control of my body composition by doing so, along with the freedom to eat anything I can tabulate the caloric and nutritional value of. Having said that, with a six pack at 132 pounds scale (sorry I think in pounds), your lean mass is somewhere around 119 pounds, which should give you a basal metabolic rate of just over 1500 kcal. Depending on how many hours a week you are training, your maintenance has to be somewhere between 1650 (for little to no training) and 2325 kcal (for 6-8 hours per week). It’s often times easier to cut weight than to maintain or lean gain, because as long as you are in a deficit, you will cut. Calorie counting must become more precise for maintenance and lean gaining. My first suspicion is that your calorie counts may have some error. When you are trying to hone in on your maintenance, even a 10% error will completely throw everything off. If you are not already using a scale to weigh your portions, I would suggest that. Cups and spoons and eyeballing is out the window when you are trying to dial it in. Also making sure you are using RAW weights of meat to assess your calories as cooking varies the weights depending on time under heat due to dehydration. Cooking oils is another one often missed. Many foods will absorb much of the oils used for cooking and a tablespoon of just about any oil is 120 kcal. This is an excellent article! Your site and newsletter are top quality and I’d recommend to anyone who doesnt want to waste time browsing YT or Internet. I’ve been cutting and lifting properly for about 4 months now I’m close to lean bulking, my lean weight is 147 pounds around, should I be a beginner and okay to eat 350 calories over to gain 3lbs a month? Yes 2-3 pounds a month would be perfect. I’ve been lifting in and off for over 10 years with very little success and had major weight issues with fluctuations along with an eating disorder. I have finall conquered all the above and have been now living a consistent lifestyle for about a year now. I’ve never really made “Gains” because I’ve always been in a “binge/cut” cycle due to issues I’ve had. I’m finally ready to start a cycle of bulking. Have I not tapped into my beginner gains yet? What can I expect to see gains wise now? In 10 years I think you’ve inevitably gotten over your noobie gains Jack. I think you can expect the rate of gain of an intermediate. Great work, concise, well organized and I appreciate your quantitative approach. You’ll probably gain muscle very well even in a deficit if you say you’ve lifted in the past. Muscle memory is real. After you have leaned down to your goal body weight would you just reconfigure your maintenance and go from there or would you use your maintenance from when you started your cut? You recalculate maintenance. Current bodyweight is the main predictor of maintenance calories. You can learn how to do it from this post. Clearly explained and very helpful, thanks. I’ll use the TDEE spreadsheet floating around reddit to “back into” maintenance numbers by tracking calories and weight over time. Do you have any experience with how muscle gains are affected by age? I am 46 now, and haven’t ever built muscle. I know I won’t be seeing the same results I’d be seeing at 25. If you have ballpark figures of what kind of surplus to aim at, it’ll be helpful. Right now I am thinking to start at 200/day, once I’ve hit around 10% body fat first, that is. You can still build muscle well at 46. It’s true, a bit slower than at 25 but I don’t know by how much. I think 2000kcal per day is a good starting point. Thank you for information. I’m from india .I weigh 87kg and 5 feet 8 inch.22years old. Can you tell me my target weight to get lean . Hi radu, nice article. Well written, understood it cleary. I have a question though, so do we just cut & lean bulk until we die/we achieved our goals? Hi Radu, great article. I only have one question. If I lifted weights in the past, with breaks, for about two – three years and then took a complete break from it for 4 years straight, should I expect to gain like a beginner or intermediate? Hey! Thanks for checking out my article! Thanks Radu, this article was exactly what I was looking for. I have been eating between 0.8 and 0.9 or so grams of protein per day and been eyeballing my portions and adjusting accordingly day to day my carbs and fat. I say day to day because I work a construction job where the intensity and calories I burn vary day to day and I have been working on getting a better sense of what days to eat a little more or less. I have been doing pretty good at eyeballing everything but it seems I have evened out over the last three months and gained little to no weight and although I am still progressing in my lifts I would say progress is considerably slower then in late spring early summer when my weight was still climbing overall and there already some plateaus in growth in some lifts. I don’t know my exact BF % but have what I would say I am generally happy with my definition. My plan is to just keep eating as I have been and simply add a little more food to tip the scale and begin slowly gaining again. My question when I hit google was how much food do I add? Your answer of 300 to 350 calories a day is exactly where I will start and monitor things from there. Once I level off again and stall out I will add a little more and I plan on continue doing so until around April when I will go for that short cutting phase you speak of. I have been using Gregs intermittent fasting as well off and on and I believe it has served me well to stay lean. I may use it off and on over the bulk but will definitely use this eating tool again in the spring when I want to lean out. I might look into one of Gregs programs you recommend as well. I ment to say 0.8 to 0.9 grams of protein per pound of bodyweight … Durp. Hi Radu, thanks this article was really helpful. I have been eating clean since March 2016. My bodyfat % then was about 19.52% and I currently stand between 9.5% to 10% to body fat. I want to gain more lean muscle but I really don’t want to loose my 6 pack. At the same time I am so obsessed to loose more body fat to have a leaner core and a better looking 6 pack. I consume about 2700 calories a day and according to my fit bit I burn 2800+ calories a day in addition I take fat burners in the morning before hitting the gym. When will be the best time for me to increase my calorie count, should In continue until summer is over and then when winter starts increase my calorie intake to about 2900 calries per day. Fantastic article and thank you! I am an experienced lifter, 40 years old, currently 160 pounds scale at 6% body fat. I just completed what I am hoping to be my last 8 week cut cycle ever. I enjoyed reading your distinction between lean gaining and clean bulking. It truly is a difference. For the experienced lifters out there who have been lifting for many years, and are passionate about nutrition, this lean gaining concept can save a ton of time! I “dirty bulked” for the first 8 years of my lifting life, starting at a skinny 140 pounds, and built myself up to as high as 197 pounds, but at 24% body fat, I just looked like a big fullback without any definition. Around year 8, I tore my pectoral tendon under a barbell while bench pressing and the post surgery recovery period changed my life. The moment I learned about and dialed in my nutrition, I felt like I wasted 8 years of lifting! I spent the first year after recovering (a 4 month intense physical therapy recovery) cutting the fat and got down to under 160 pounds, but still had about 9% body fat. So, I started bulking for 4 months, put on about 12 pounds back to 172 pounds, and body fat increased to about 11.5%. Fast forward to now, I cut the 12 back off to get back to 160 pounds and my body fat this time around is 6%. I have vascularity everywhere and my six pack looks like a six pack, not like just a slim mid section from last year’s cut. I determined over the bulk that I was able to gain about 2.5 pounds of that 12 from pure muscle, which puts me at a rate of 0.6 pounds per month. This lines up closely with the Alan Aragon model of 0.5% per month for experienced lifters. I don’t see this number changing much over the near future, so I plan to eat literally just 70 kcal over maintenance to gain 0.6 pounds per month and match my muscle growth and see if it works out as perfectly as I think it should, based on the logic that a worker cannot build a house any faster given extra materials. I scale weigh all my food, so I have a highly accurate measure of my calories, which is why I can confidently control such a tight variance of 70 kcal. As my lean mass grows, so will my calories. I have found Katch-McArdle for BMR: (LBM*9.8)+370 – in pounds – combined with the proper activity multiplier to be rock solid when compared to actual results over time. I currently use an activity multiplier of 1.725, because I train 1.5 to 2 hours per day, 6 days a week. I have found 1.55 to be an accurate multiplier for training 5 days a week, and 1.45 for four days training per week. Hi,Radu . I’m lifting and also cycling. I’ve been cutting again after a four month break in diet and training due to an accident. I started training and cutting and my waist is at roughly 77ー78 cms on average I’m 178 cms tall. Over all about 9 months of training( excluding the four month break). The current cut took a lot less time than the last , about 2 and half months. I want to start lean bulking. I started at a cutting level of 1600kcl a day then graduated up to 2120 calories a day. With the cycling and calorie deficit I managed to get very lean, maybe 10 to 12 percent body fat, but not sure really. With my cycling ( about two hours a day) and current calorie intake would a increase of about 200 to 300 calories be okay to start lean bulking? Possibly more? Even on 2120 calories a day I’m seeing weight loss but not losing muscle much with decent to fair muscle definition. Please advise me on a rough estimate of how many calories I should raise above my current maintenance calories to start with to lean bulk. Any advice would be greatly appreciated. Hello Radu. I saw in some of your videos the actor Stephen Amell who plays in the show “Arrow”. What can you say about his physique in season 5 of Arrow is he bulking or cutting? Cause I think he is bulkier that season 1. When cutting you should aim for about 1g per pound as well. If everything you and others are saying is right, why do actors always eat a crapload of food? If I use Greg’s numbers for calculating my average calorie intake (15x desired bodyweight) I end up with around 2500 calories. With a surplus of 500, that’s 3000 calories. Most actors such as Zac Efron, who is not really a big guy, ate close to 6000 calories in preparation for Baywatch. The actor from Captain America ate just as much. They all ate that much to gain a lot of muscle for their movies. They must have eaten like 600g of carbs a day. Do you agree that this is very contradictory to what you’ve said in this article? I’m not saying you are wrong but I’d like you to elaborate on why all the big guys in the movie industry seem to eat way more than you and Greg want us to eat. Also, I’d like to point out that I do not see a difference between the picture taken before the lean bulk and the last picture. The different lighting might make it seem like you gained a tiny bit but there is not a huge difference. It only contributes to my skepticism right now. Natural lifters can gain around 20-25 lbs / 9-11 kg of muscle in their first year. Now, depending on the person it may take around 2000 kcal to create one pound of muscle / 4400 kcal for 1 kg of muscle. When bulking to maximize muscle growth, fat and muscle are usually gained at a 1:1 ratio, meaning for every pounds or kilogram of muscle you gain you usually gain 1 kg of muscle as well. Depending on the person it takes a minimum of 3500 kcal to create a pound of fat or 7700 per kilogram. A minimum of 66 000 surplus kcal are needed to allow that person to gain that weight in a year. If we spread it over 365 days we get: 180 kcal per day. Now, naturally skinny people resist weight gain by burning a lot of calories through NEAT (fidgeting, house work, moving around a lot). Their genetics also gave them a high metabolism. So these individuals may require twice that amount, so it could be 130 000 kcal/year or 350 kcal/day. Now, most people have a maintenance of 2000-3000 kcal. Intermediates probably around 2500. Therefore a 3000 kcal intake while bulking is close to ideal for such a person (some calories are also required to replenish glycogen stores). Eating a surplus of 1000 or 2000 kcal per day to maximize muscle growth is stupid. If you can gain only around a pound of muscle per month, you may need a monthly surplus of only ~7500 kcal (2000 kcal for muscle, 3500 kcal for fat, and an estimated 2000 to cover NEAT and glycogen replenishment). Everything above that limit will just unnecessarily convert into body fat. So if you eat a monthly surplus of 30 000 kcal, ~7500 may contribute to muscle growth and the inevitable fat gain that comes along with it but around 23 000 kcal may uselessly be converted into 3-6 lbs of body fat (depending on your genetics). If you don’t believe me, try it. And regarding the actors…I’m always skeptical of their calorie estimations. They may eat a lot of food and think “oh yeah I’ve probably eaten 6000 kcal!” when in reality it may be only 3500 kcal. Unless I actually see them weigh and track their macros on camera I don’t believe it. Even with a ridiculous amount of physical activity you cannot prevent a daily surplus of 3000 kcal from turning you into a fatty in a few weeks or months. Hi! Thanks for all the info. Have been really useful. I have a question to ask: I oftenly mess up when it comes to calories. Should i eat less on non training days, or eat an average every day, or how? how many calories do i need to clean bulk?